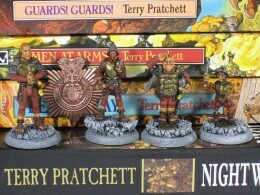 I’m spending this weekend at Norwescon, and since a huge portion of the convention is devoted to sci-fi and fantasy literature, there will probably be multiple tributes to the late Terry Pratchett. This is also a good time to remind Billfold Book Club readers that we’ll be discussing Pratchett’s Men at Arms on Thursday, April 23. I’m excited to explore the economics of Pratchett’s Discworld and — as he no doubt intended for us to do — compare them to our own. Who else will be reading Men at Arms with us? Will you be first-time Pratchett readers, or will this be your fourth or fifth pass through the Discworld series?